It’s time to talk wedding budgets. To reduce wedding planning stress, it’s important to plan your budget in advance. You’ll want to make sure you and your fiancé are on the same page about what your top spending priorities are – and what you’ll be able to compromise on. Typically, your reception will eat up the bulk of your budget. To avoid any surprises, you’ll want to plan accordingly and be sure to leave a rainy day fund for unexpected costs. Photo Courtesy of Jodi Gray Photography. One of the first things you’ll have to decide on is your wedding venue. There’s a myriad of options out there and you might consider everything from a barn to a ballroom – but no matter what you choose, this will most likely be the biggest line item on your budget. The average venue costs $5,400 (source) and most couples spend between $2,700 to $10,500. There are a number of factors that can impact your venue cost. Date: One of the biggest things that can impact your venue cost is your wedding date. 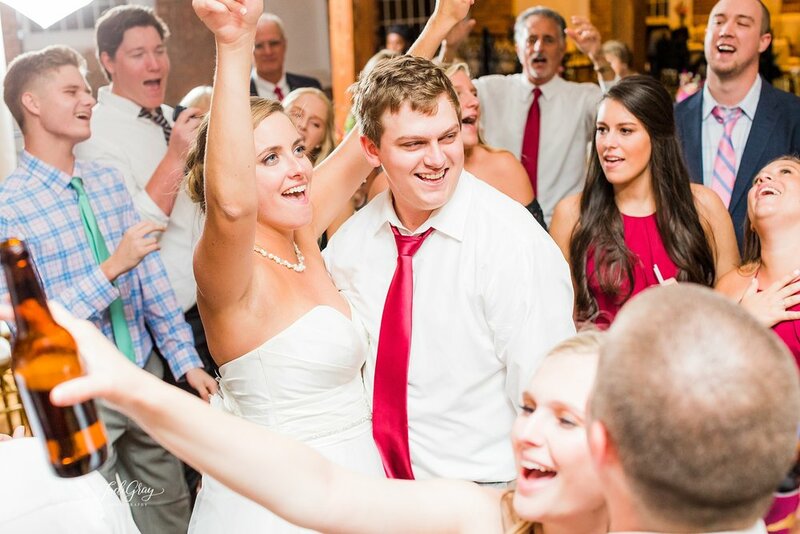 A Friday or Saturday wedding will typically cost more than an event that takes place during the week or on Sunday. If you’re looking to save, consider a Sunday brunch wedding! Tone: The more formal, the more expensive. A formal wedding means creating an overall upscale vibe – and things like a seated meal, fancy band, and all out decor can quickly add up. Guest count: At Revolution Mill Events we offer flat rate pricing for our venue for up to 200 guests. But keep in mind that you’ll be paying per person for catering so the more people you have the more you’ll be spending. Outside vendor fee: Many venues have approved vendor lists or will charge a fee if you hire a vendor outside of their approved list. At The Colonnade, Pepper Moon Catering is proud to offer seamless event management and exclusive catering. We require that all food (with the exception of cakes and specialty desserts), beverage, and equipment rentals must be secured through our team. However, contracted vendors are welcome to provide other goods and services without an additional fee. Parking: Keep in mind that if you select a downtown venue or a venue with valet parking your guests (or you) may end up paying parking fees. Both of our venues offer ample free parking, including a large amount of handicap spots. Photo courtesy of Danielle Defayette Photography. When comparing venue costs, you’ll want to keep in mind what the venue rental fee includes. Does it include basic furniture, flatware or linens? 77 percent of venues include tables and chairs, but this is something you’ll want to verify. Starting to panic about how much this is all going to cost? The Knot offers a free Wedding Budget Calculator to help make sure you’re allocating your funds to the right places. Check it out here. If you’re looking for more details on what The Colonnade includes with our rental, check out our Wedding Guide here.